Hi guys! Happy new month to you all. i can't believe we're at the second quarter of the year already...How time flies. 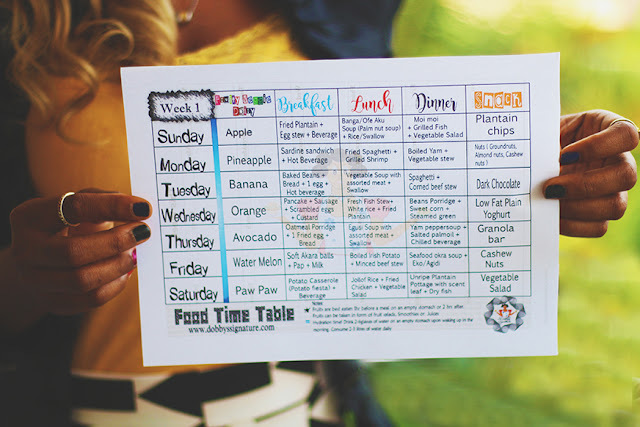 Talking about time and to start off the month, i've got this easy food time table for download to make your everyday meal planning easy. If you are a busy person, this meal plan would come in handy as well as help in taking the pressure away. ♥ If you look closely, you'd notice a blue line on the time table. The line stands for water which our bodies need as a universal solvent to function properly. I've noticed that prioritizing early morning hydration helps the body tremendously in so many ways. It also helps in flushing out the toxins built up overnight while asleep. Whether you're looking to simply stay healthy or lose weight, water should be a crucial part of your morning routine. ♥ Some of the meals on the list such as soups could be prepared and stored in the freezer to cut kitchen time short. ♥ Fruits and salads could also be prepared the night before and stored in the refrigerator to make meal prep easier. ♥ The most important meal of the day is breakfast so "Do not" skip grabbing something in the morning even if you're looking to lose weight. Looks great. Thanks for this. Got some great ideas from this. I've downloaded for reference. Are you going to do one each week for the month? Yes i'm working on weekly time tables for the month. please aunty Dobby can you send to my email. Thanks for this. Now I know how to go about my meals. Nice Ma. I need to send my ADERONKE to learn more from you Ma. nice one. its really interesting. Glad you like it Abode. Would work on that Raji. can seem to see timetable for adult with main diet, dessert and appetizer for a whole week. Nice Job Dobby Signature. A million Gbosa !!!!!!! Welldone ma,i really appreciate this.